It shouldn’t be easy to pick promotional e-mails out of one’s inbox and recite the litany of ways in which the authors missed the boat. But it is. One reason, I suspect, is that prominent media companies such as IDG, ZDNet, and others have started to provide “turnkey” campaigns to advertisers, meaning they not only provide the list and the media but also the creative. This may be a harsh assessment, but it appears to me that when media companies start to develop copy and design, there’s often a certain casualness about how some of the resulting creative gets developed, almost as if the author is saying: “Well, the list doesn’t cost us anything, so if this doesn’t work we’ll find some other way to generate the leads.” Such e-mails are often part of package deals: e-mails + banner ads + white paper postings, etc. for which a certain number of leads are guaranteed, regardless of whether one component or another fails miserably. The following e-mail is one such example. I don’t know for a fact that ZDNet developed the creative, but I suspect so. (Perhaps I’m simply giving EqualLogic the benefit of the doubt.) But the copy has the air of something provided as raw product information by the advertiser and jammed into a pre-existing template without much regard for even the most basic of e-mail best practices. 3. The rest of the e-mail is where the authors really lose their way. 80% of the copy reads as if it were lifted in its entirety from the back of a data sheet. If I was looking for reasons to respond, reasons for why the afore-mentioned Tech Brief should be of immense interest, I would be bitterly disappointed. Instead, I get a litany of descriptive features about the product, not the offer. The bulleted list in the center of e-mail would be much more effective if they were communicated as benefits of receiving the offer, i.e. “Download your free guide today and learn how to increase storage utilization, improve IT productivity, etc.” Even then, the bullets need to be fleshed out to be made more credible. “Improving IT productivity” is a claim virtually every technology company in the business makes. How exactly does EqualLogic and Thin Provisioning accomplish it? 4. 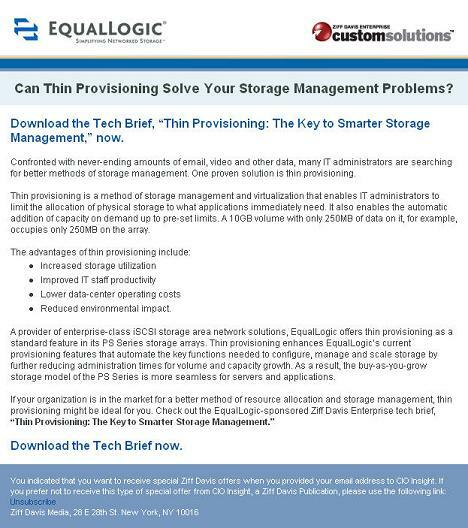 The last paragraph is a throwaway: “If your organization is in the market for a better method of resource allocation and storage management, thin provisioning might be ideal for you.” How anemic. If I’m not “in the market” for these things, apparently I shouldn’t care much. Or even if I am in the market, the solution might be ideal for me, it might not. This is not compelling, action-oriented, direct response copy. I don’t mean to beat up too severely on ZDNet. They’re a reputable company with some very effective media properties that perform well for CDI clients. I just expect better. This entry was posted in Creative, E-mail, Offer Strategy on September 17, 2007 by Howard Sewell. Howard, another comment on the last paragraph and why it’s dangerous: The whole ‘in the market…’ puts up a roadblock that *shouldn’t be there* at this stage. I.e., if this is meant to be a *lead-generating* email, the target readers probably are NOT ‘in the market’ yet…*even if* storage management is an issue for many of them. Because even if it *is* an issue, these folks have many *other* issues demanding their attention and $$. The whole point of the offer (the tech brief) is to get them thinking about their day-to-day lives in a way they might not have…and as a result of having read it, conclude this issue is something they want to (and can) deal with sooner rather than later. I.e., they’ll realize for themselves they should be ‘in the market’! And from there they’ll contact EqualLogic asking for more information. Mike – Well put; I couldn’t agree more. Of course the reason “in the market” even appears in the copy is because the writer is oblivious to the point that he or she should be promoting the offer. Instead, the e-mail is essentially a product description: here’s what our product does and why you should want it, and if you’re in the market for such a product, contact us. The tech brief is an afterthought.